Let’s strategize a feasible plan to help you get more business from Lee’s Summit and the surrounding area. As one of the most progressive cities in the Kansas City Metro, the City of Lee’s Summit is on it’s way to becoming a contender as the darling of the Metro. The City provides interesting business opportunities. People still flock to the City even though rents have drastically increased over the years, and there must be several reasons for why Lee’s Summit is becoming so popular. Luckily for you, if you’re targeting this market, you’re covered within the service area for SEO. The City of Lee’s Summit also draws a diverse community. From one side, you have young families benefiting from one of the State of Missouri’s top school districts, and on the other side, you have national recording artists going in-and-out of the rapper Tech N9ne’s record label headquarters. With new business developments, new markets arise in the area. In the event that you’re looking to grow your business and want customers from search engines to find you, you can count on our SEO Services to help you. Learn more about how our SEO Agency can help you with your next search campaign. When you’re looking to forecast the future, a good resource is to see some recent data. According to search data from Google Trends, searches for “Lees Summit” in search engines show a strong trend. This might be useful when you’re considering entering into the local market in Lee’s Summit or beyond. When there is a trend of people searching “lees summit”, there is a market to target. Increase your rankings in Local Search – by ranking higher for local-related searches, you’re going to be able to attract and convert more local customers. Improve your visibility in Maps Search – when you search for a company on search engines, oftentimes the Map App will pop-up on your mobile phone. When you rank higher in maps, more local customers will go to you! More visible for Local Social Searches – you can target users on social media sites, and attract locals to your business (eg. #leessummit). Can you see how these tips might improve your business? The line graph above shows the trend of “Lees Summit”-related searches originating from local Kansas Citians. By understanding the macro-data, you could formulate strategies for targeting the local search market. What type of business do you run? We can help you target the right audience online. For example, we track all the new searches relating to “Lee’s Summit” and the surrounding KC area. We do this to identify rare opportunities. Pretty much anything related to Lees Summit, we can target. For example, if you have a local service business, we can actually help you rank higher in search engines for that search term with our optimization services. Contact us today to learn how we can help with your marketing campaign and optimization. 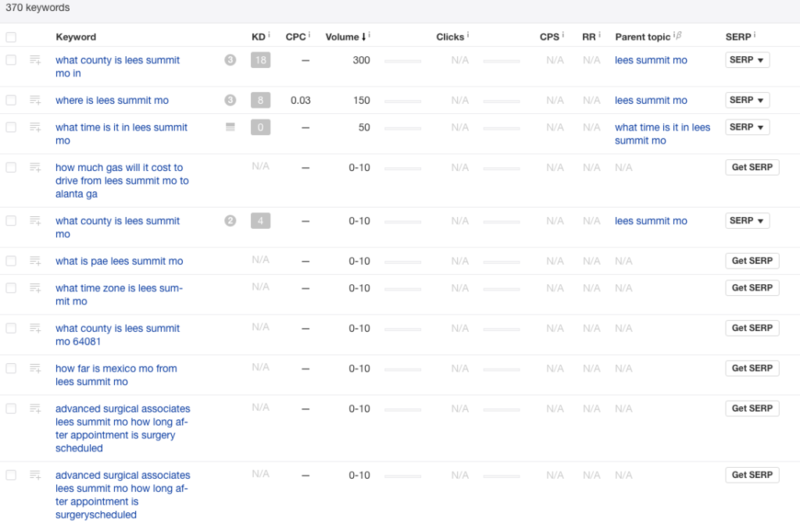 Here is an example report we run to identify, review and target search terms related to “Lees Summit MO”. This is a keyword research technique in search engine optimization (SEO). For this particular report, we identified 370 new keywords relating to “lees summit”. With this information, we can help you rank for those new keywords in search engines. With this implemented for you, you can attract all the new customers for your business. Are there any keywords about Lees Summit that you want to rank higher in search engines? Do you want to? It all starts with a convo.